Public speaking. Your hands become ice cold, shaky and numb, your forehead begins to form beads of sweat from the scalp down. You realize that you need to rid of that wet visible perspiration ring that’s beginning to form underneath your arms. For the majority of individuals, being forced to speak publicly is right up there with getting their fingernails pulled out with a pair of pliers, or piranhas scenting your blood and beginning to bite at your ankles, this when it comes to absolute fear and things which are terrifying. There comes that time when you’re eventually asked to make a speech, make a presentation on your project, and you’re expected to be clear, concise, and communicate effectively with confidence. So listed are some of the time tested methods on how you can appear as a seasoned public speaker, by attacking and then facing the fears which are associated when it comes to this intimidating situation. • Just Breathe – That sounds simple enough, but it never quite feels that way once you’re standing up there on the podium. Once your body becomes nervous, what happens is it naturally tightens and tenses up, which then causes you to take short shallow breaths, which doesn’t help you whatsoever once you begin talking. Improper breathing will cause you to rush through your sentences, or you’ll begin tripping or mumbling over your words. So when your practicing in front of the mirror in the safety of your home, make sure that you also practice natural breathing techniques as well. Another method is to highlight all of the important areas of your speech, as doing so will help you in getting a better sense and reminder on how often you need to be breathing, this to properly deliver your speech as comfortable as possible. Try maintaining this breathing throughout your speech, especially when you feel everyone’s eyes are trained directly on you, and the smallest gaps of silence can feel like an eternity while it’s actually mere seconds to your audience. Pausing is always a natural part of the speaking process, so just take a moment for a nice long deep breath before you continue with your talk. • Practice As Much As Possible – Know that the actual material which you present is an extremely important and vital part of your presentation. Become as comfortable as possible with what you’re wanting to say becomes critical, and all that takes is a bit of rehearsal. In the days leading up to your public speaking engagement, run through by practicing exactly what you’re going to say so you become familiar with the flow of the material. Keep in mind that all this prep work which you do is conscious, as what the brain is able to do is process all of this information while you’re sleeping. That’s the reason why you’re at times surprised by how much information that you’ve absorbed once you wake up. Once the actual day of the speech arrives, try avoid reading your speech over and over again, as what doing so does is cause too much stress and anxiety. Approximately 10 minutes before your speech, make sure that you relax as much as possible by breathing deep and hydrating. Know that you’ve prepared yourself as best as possible, and then just get out there and speak to your audience. • Know That You’re Not Alone – When you step up to the podium for the very first time, when you’re there all alone in front of a crowd and you’re nervous, it then becomes easy to see them as the enemy. You might begin to worry that they’re judging your each and every word, your every twitch and inflection, and then as a result you become overwhelmed and begin to feel suffocated. Know that these feelings are completely natural, and the majority of times just a creation of your own imagination. All that your audience wants is you to succeed and communicate effectively to them as they’re there to learn or be entertained by what you have to say. As you know, you can easily be your own worst enemy. So the next time that you begin to get panic stricken after you’ve made a bit of a stumble during your speech, make sure that you take a deep breath, and then just remind yourself that everyone is on your side. 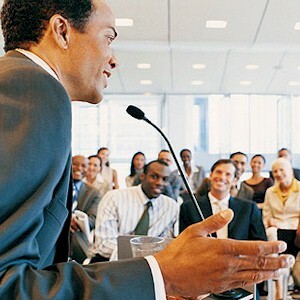 • Join A Public Speaking Group – Public speaking is known to be one of the biggest common fears. The idea of you standing up in front of a group of people who are staring at you, what that does is it triggers the renown “fight-or-flight” response. That’s why there are organizations such as Toastmasters International which are available to help you overcome this fear. These are completely pressure-free meetings, allowing you to work with other like minded individuals to improve your communication as well as leadership skills. So if you’re ever interested in why and how others have improved or are completely confident when it comes to their public speaking abilities, and you’re wanting to learn how you can be the same, then find a local Toastmasters International meeting near you and begin talking.